When negotiations erupt into all-out war, one man’s resolution becomes a matter of life and death! Yugo’s negotiations in Pakistan are off to a rocky start, as he is captured by the anti-government dacoits as a prisoner rather than received as an emissary. Sentenced to roast in the sun, he must survive gruesome torture to prove his worth as a hero to the fearsome dacoit leader, Yusuf Ali Mesa. To make matters worse, bloodthirsty Lieutenant Colonel Shadle from the Pakistani Army is hunting Yugo down at every turn to stop the negotiations and wipe out the dacoits. In a war of words, mind, and military might, Yugo must show his adversaries what a true hero is made of. Yugo the Negotiator Pakistan 2: Honor (SRP $29.98 DVD) is a DVD-only release including episodes four through six, presented in both English 5.1 and Japanese 2.0 with English subtitles. 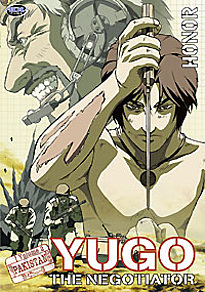 Extras include an interview with series director Seiji Kishi, an interview with Japanese voice actor Takashi Hagino (Yugo), an interview with Takehiko Matsumoto (Character Designs) and Kazuharu Sato (Series Planning), a music video, “Personnel Dossiers” covering the major characters, and a special segment, “The Japanese Depiction of Pakistan: Comments on Yugo,” by cultural advisor Nawaz Charania and ADR director Scott McClennen, plus clean opening animation, clean closing animation, and previews of upcoming ADV Films releases.